A highly enjoyable, practical, hands-on day experiencing the joys of turning greenwood using a pole-lathe. Pole-lathe technology has been used for millennia to turn all sorts of things, from stone beads to wooden bowls, children's toys to chair legs - a craft that was still alive as a profession only 50 or 60 years ago until it was made obsolete by modern power tools. Suitable for complete beginners and experienced wood-turners. 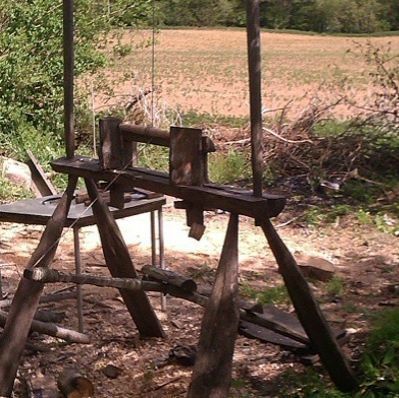 You will go through the process of taking a fresh cut log and using an axe, drawknife and finally chisels to turn items on a foot-powered pole-lathe to take home. An introduction to and demonstration of the tools we will use, the wood and the process of turning greenwood on the pole-lathe. This starts with splitting a billet from a log, axing a blank, shaving the blank on the shave horse using a drawknife then mounting the blank on the pole-lathe to start turning. Pick up the tools and have a go. Richard will be on hand to help out and answer questions. A demonstration and instruction of how to use the axe and shavehorse to make shaved items and your chance to have a go. Once you are familiar with the process (and if time allows) you can continue making other items. An informal, fun, hands-on day in a small group, learning and experiencing the joys of turning greenwood on a pole-lathe. You will be hooked!